Isabella Rutkowski wears her scarf over her face to stay warm as she walks into Battle Academy. View our in-depth weather forecast. See school delays and updates. The Salvation Army asks for donated new space heaters, gloves, hats and hand warmers. Monetary donations are also needed to assist with high utility bills. No blankets are needed. Donations are being accepted at the Salvation Army at 822 McCallie Ave. Monetary donations can also be made on line by visiting csarmy.org or by calling 1-800-Sal-Army. Eric Wallace looks for a warm piece of clothing among a rack of shirts and coats at the Salvation Army. Colder weather is expected to roll in on Wednesday in Chattanooga. Temperatures will plunge to about 11 degrees in Chattanooga tonight -- even lower in the suburbs and rural areas -- with fierce wind chills that will make it feel like 15 to 20 degrees below zero. "Thursday morning is going to be unbelievably cold," said WRCB-TV3 chief meteorologist Paul Barys. That will make for a rude welcome for Hamilton County students, who return to class Thursday following Christmas break. And the bitter cold forecast isn't just for Chattanooga. 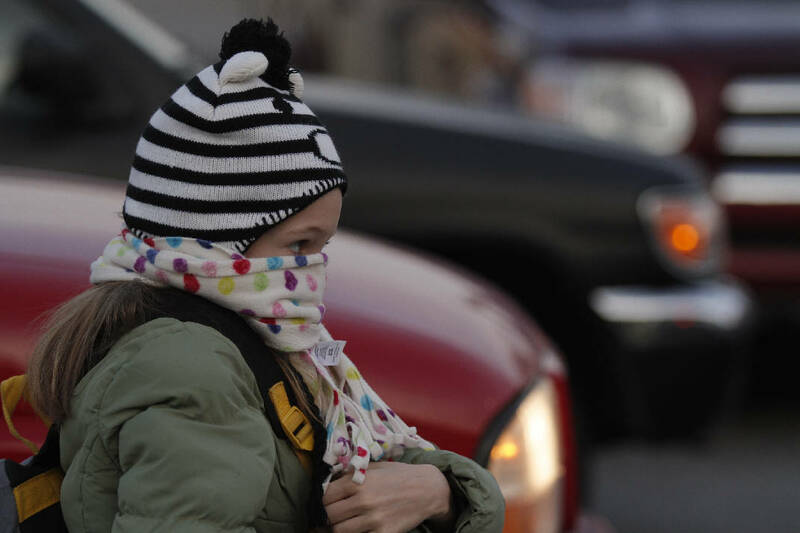 Arctic air is expected to grip the eastern two-thirds of the nation by Thursday morning. Wind chill warnings have been issued across a handful of states from Montana to western New York. Temperatures as low as 8 degrees are expected Thursday morning as far south as central Alabama, and wind chill readings of less than 5 degrees are forecast in metro Atlanta. In Chattanooga, the subfreezing cold will begin today. "By the time people read the paper (today's) high would have already occurred," Barys said. Today's high of 34 degrees was expected to come around midnight, then fall to the 20s before climbing back to near 30 and plummeting again tonight. Northerly winds of 10-15 mph will make it feel even colder. It hasn't been this cold here since January 2014, when low temperatures hovered in the single digits. Little precipitation is expected to accompany this cold snap, though a few snow flurries are possible, according to the National Weather Service in Morristown, Tenn.
On Thursday, the high won't get above freezing, Barys said. Expect a peak of about 28 degrees, though it will be sunny and winds will die down. Temperatures will begin to moderate around the weekend, with lows in the upper 20s to 30s and highs in the 40s. The frozen forecast sent residents in search of warm clothing. Kenneth Hill cried while thinking about his sister as he looked through a rack for warm clothing at the Salvation Army on Monday. He said he and his sister live in a house with no running water, electricity or heat. * Battery and ignition system should be in top condition and battery terminals should be clean. * Be sure heater and defroster work properly. * Insulate pipes with insulation or newspapers and plastic and allow faucets to drip a little during cold weather to avoid freezing. Running water, even at a trickle, helps prevent pipes from freezing. * Learn how to shut off water valves in case a pipe bursts. * Insulate your home by installing storm windows or covering windows with plastic from the inside to keep cold air out. * Keep fire extinguishers on hand, and make sure everyone in your house knows how to use them. House fires pose an additional risk, as more people turn to alternative heating sources. Pneumonia racked her body just after Thanksgiving. She recovered. A stroke disabled her on Christmas Day, but at least that got her into the hospital and out of the cold, said Hill. "She's going to get better," he said. He was among hundreds of people flocking to the Salvation Army for clothes, coats and blankets to shield themselves and their families from the freezing cold. Hundreds of calls flooded the Salvation Army this week from people requesting assistance with utility bills and supplemental heat. The Salvation Army asks for donations of new space heaters, along with gloves, hats and hand warmers for people who are homeless. Nearly 2,000 Americans die each year from weather-related causes, and more than 60 percent of those deaths are because of cold weather, according to a 2014 report by the U.S. Centers for Disease Control and Prevention. At least one homeless man died in Chattanooga in 2010 because of weather-related circumstances. He was found just after Christmas near a downtown railroad track, according to Chattanooga Community Kitchen officials. Eric Wallace plans to endure this bout of arctic cold outside in a tent, and he's not the least bit worried. "The good Lord takes care of me no matter what," said Wallace, who became homeless two years ago after his wife died from cancer. His tent is insulated with 20 blankets and tarps. Another 20 blankets cover his sleeping bag. But another layer couldn't hurt. He was at the Salvation Army on Monday for socks and sweaters.